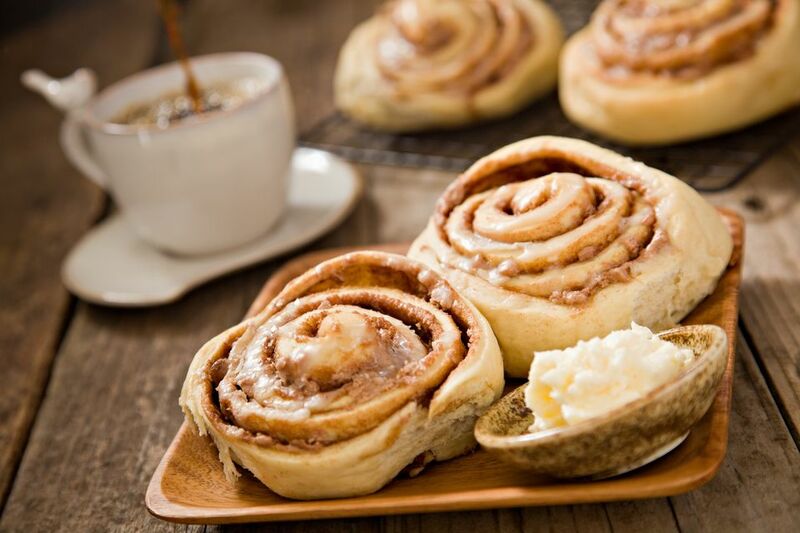 Nothing smells better than freshly baked cinnamon rolls! The yeast dough for these special cinnamon rolls includes sour cream. The rolls are filled with a mixture of cinnamon, brown sugar, butter, and pecans. In a bowl, dissolve yeast in warm water. Blend in cup sugar, eggs, sour cream and 3/4 cup plus 2 tablespoons butter. Put flour and salt in large bowl. Make a well in the center and add yeast mixture, then slowly work in flour. Mix with hands until smooth, then shape into balls. Place in greased bowl. Cover and refrigerate 4 hours to 3 days. Roll out dough into a rectangle. Spread dough with 2 tablespoons butter, then sprinkle on brown sugar, 2 teaspoons cinnamon and chopped pecans. Roll out like a jelly roll and cut into 12 slices. Place on cookie sheet and flatten. Spread with 2 tablespoons butter, then sprinkle with 1/2 cup sugar and cinnamon. Let rise 10 to 15 minutes. Bake at 400 F for 10 to 15 minutes.